Today the world’s attention is turning to the announcement of new climate commitments by the US and China. Using our global climate simulation C-ROADS, we have calculated the impact of the new commitments on the climate. We estimate that the new commitments by the US and China would, if fully implemented, keep 640 gigatons of CO2 from being emitted into the atmosphere. The total of 640 gigatons is greater than all global fossil fuel emissions from 1990-2013. And, as a thought experiment, if all developing countries were to cap emissions in 2030 consistent with China’s proposal and all developed countries were to take the same reduction action as the US, then 2500 gigatons of CO2 would not be emitted into the atmosphere. Previous US, EU Pledges. US and EU Copenhagen Commitment plus recent EU commitment: A scenario in which the US and EU meets their Copenhagen commitments and the EU meets its recent additional commitment (40% below 1990 by 2030) and the rest of the world follows the RCP 8.5 scenario. Previous pledges plus new US-China Commitment. 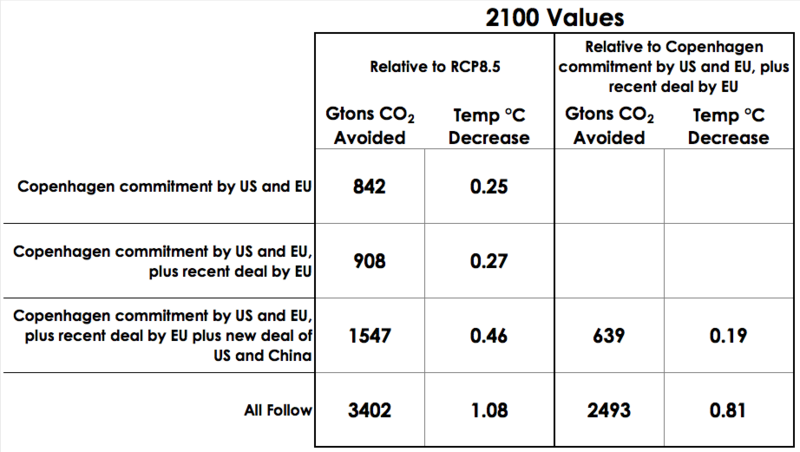 US and EU Copenhagen Commitment plus recent EU plus new US and China commitment: A scenario that includes all the assumptions of #2, above, plus the US and China meet the commitments announced on November 11, 2014 (China peaking CO2 emissions in 2030 and US reaching 27% below 2005 levels by 2025). 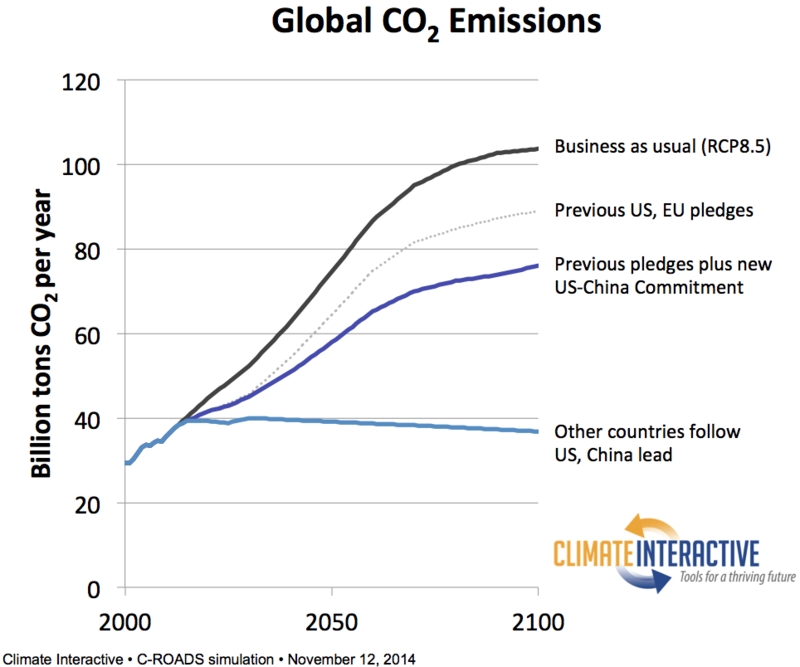 Other countries follow US, China lead: A scenario in which all developed countries (as defined in C-ROADS simulation documentation, and not including the EU, which follows its new pledge) reduce emissions 27% below 2005 levels by 2025 and all developing countries (similarly defined) peak emissions by 2030. These new commitments could enable more ambitious commitments by other parties. Analysis from the world’s top energy and climate experts has shown again and again that transitioning to clean energy and making large reductions in future greenhouse gas emissions is technically feasible. (See for example: the IPCC, the International Energy Agency, and UNEP). Hundreds of people around the world have discovered this fact for themselves using Climate Interactive’s World Energy Exercise. To date, capturing this potential has been limited by the political will of the world’s nations to take decisive action. While the new commitments do not, on their own, secure a livable climate for future generations, they could encourage more ambition in other countries. If this happens, the impacts of these new commitments could reach far beyond 640 gigatons of direct emissions reductions. These new commitments will drive prices of renewables and efficiency downward for everyone. To achieve their pledges, the economies of the China and the US will have to make large investments in energy efficiency and renewable energy. Such investments pay a double dividend – not only do they reduce emissions, but they also make it more feasible for others to reduce emissions in the future. For example, as more units of photovoltaic energy or more wind turbines are manufactured and installed, the process becomes cheaper, putting wind and solar within reach for more households and businesses. And, in today’s interconnected global economy, progress in these large economies will diffuse throughout the world. Immediate and local benefits. Beyond the long-term and global benefits to the climate, the citizens of China and the US will experience some immediate local benefits from the actions that will be taken to meet the new climate commitments. Fewer people will die or be injured in the process of extracting, refining, and transporting fossil fuels, and less ancillary pollution of water and ecosystems will occur. The air of cities and around power plants will be cleaner, and respiratory aliments and associated health care and productivity costs will decline. Recent studies (for example a global study by the World Bank and ClimateWorks and a US study by the Harvard School of Public Health) have documented the fact that serious action on climate change could save billions of dollars and millions of lives around the world. Future emissions are held constant. For each commitment we assumed that there would be no further policy change after the target year. For example, we held China’s emissions constant at 2030 levels. Were China to reduce emissions after 2030, this would result in even more avoided emissions. We don’t account for some interconnections in the climate energy system. For example, reductions in emissions will likely mean reductions in aerosols that are also products of burning fossil fuels, and some of these emissions have a cooling effect on the climate. We didn’t include any changes in non-CO2 greenhouse gases or land-use emissions, yet those changes would most likely come along with serious commitments to act on climate. In the ‘all follow’ scenario we didn’t include the Copenhagen pledges of parties other than the US and EU. Because of this simplification the ‘all follow’ scenario counts some amount of reductions that have already been pledged, making this estimate a slight over-counting. Notwithstanding the relative improvement in emissions as a result of this deal, the troubling thing is that emissions and consequently global temperatures will continue to rise. Henry — Well said. Yes, you are correct that this deal is insufficient to put the world on track to limit warming to the goal of two degrees C. Indeed, emissions would need not just to stop growing, but decrease in the range of 80% by 2050, due to the “Carbon Bathtub” dynamics described in various places on our site. We are finding it helpful to dispense with the possibility of there being a silver bullet such as a US-China agreement. Instead, it is one more piece of “silver buckshot” that could contribute to success. How do you get a net 10% reduction, when China and others are increasing for 15 years? They are currently around 70% of global emissions and increasing. You account for a 27% reduction from the 30% of emissions that are USA and Europe, which results in 22%. How is the 70% staying flat for 15 years? Mike — Appreciating you contributing to this work with good questions. I’ll admit I was stuck for some time when I read them. Yes, it seems counterintuitive that emissions would stay flat. But then I looked into a bit deeper. We might have used a different assumption for country grouping than you. We have 62% of the emissions in the developing world in 2014 (Not a huge difference). And note that the developed country reductions (the remaining 38% of emissions) are decreasing to 27% below 2005 (much lower) levels, not current levels. The main answer is this: The emissions reduction from the developed countries dropping to 27% below 2005 by 2025 relative to the path along RCP 8.5 is just about equal to the emissions increase from the remaining 62% of emissions in the developing world increasing along the RCP 8.5 scenario through those years, so the global emissions stay roughly flat. What sources are you using for CO2 emissions? CDIAC only goes up to 2010 with estimates to 2012. Using their numbers, I am not seeing how to get a grouping that has 2005 levels higher than current(2010). Are you including Mexico and Brazil and the like as well in the developed category? Appreciating having people out there who like digging deeply into the numbers. We do indeed use CDIAC through 2010, including bunker fuels. Mexico and Brazil are both in the Other Developing group. Other Developed includes Russia, other Eastern Europe, Canada, Japan, Australia, New Zealand, and South Korea. I wonder if it would be useful, as a communication tool, to plot the derivative of these curves to emphasize changes in rates?